You are here: Home / Featured / Huddle Up, Hutch! Steve Miller’s interest in Hutchinson High School football began when he joined the football staff in August of 1976, and the Salthawks have held a special place in his heart ever since. During his years as head coach of the Hutch High football team, he began to keep detailed records for each season. Eventually he decided to publish a book that would chronicle the history of Hutchinson High School football. Over a period of seven years, he made almost-daily treks to the Hutchinson Public Library and the Hutchinson High School Library, reviewing microfilm and print articles about Hutchinson football. Finally, the book Huddle Up, Hutch! was published and fulfilled his dream to showcase and properly preserve Hutchinson’s football history. Of course, the next goal was to sell books, and this website is the promotional venue for doing just that. For this site, we wanted to include not only background information and details about the book, but also a few “peeks” at actual pages.The book itself presents 435 total pages of fascinating and inspiring stories and features as well as photos, game summaries, facts, and statistics covering over 120 years of Hutchinson High School football. One design consideration involved the Hutch High colors of blue and gold. Although those colors are perfect for uniforms and promotions, if they aren’t used well, they can be less than professional looking. 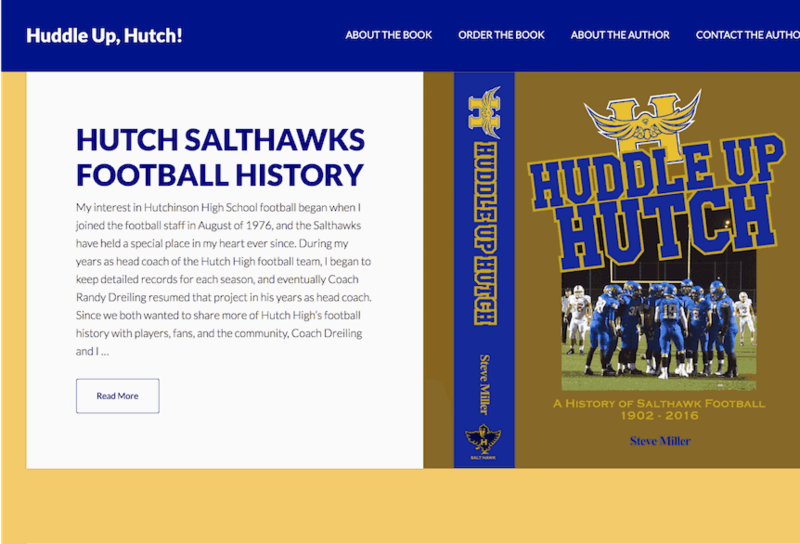 I think we created the perfect color scheme for the website to showcase the book but also project the Salthawk pride that all Hutch High graduates and supporters feel deeply. Check out the Huddle Up, Hutch! website AND the book itself!